The Boy in the Mist first appeared in the anthology entitled Big Book of New Short Horror and is now available here to read for free. She stood in the doorway watching Beth sleep clutching her new stuffed dog. The night light shone dimly upon the balloon caught in the flow of the air vent, dancing upon the invisible draft. Karen crossed the floor to her daughter and pulled the covers up to her shoulders. They say the first five years are the formative years. That’s what worried her. She wondered if it was okay to make a wish on someone else’s birthday candles. She’d done it anyway. As Beth had leaned in to blow, Karen had closed her eyes and wished. It was worth a try. Like the birthday girl, Karen would never tell. No one would believe her if she told them her wish. The eyes at the end of the bed glared at her. An army of stuffed animals stared at her judgingly from their perch at the foot of the bed. They were the witnesses. They see and hear everything. Karen felt strangely conscious of their judgement. Guilty as charged. She didn’t know what, but she must have done something wrong. The bear, cow, sheep and unicorn knew it. After all, when a child acts out for attention, it has to be someone’s fault. Leaving the door open as promised, she quietly walked down the hall to the kitchen. Her abandoned glass of wine stood guard by the drawings on the table. Karen gulped down the wine and cringed at the bitter taste. The teacher didn’t want the drawings with the others lining the wall at school. No, Beth’s were different. Picking up one of the pictures, she heard the words of Beth’s teacher. They were trained professionals. She’s a good girl, doesn’t cause any problems, but the pictures were disturbing. Karen lay her head on the table, staring at the offensive drawings, and fell asleep with worries for her daughter tumbling through her mind. That’s where Beth found her mother the next morning. Karen shielded her eyes against the glare of daylight that streamed across her face. Her arm felt numb trapped beneath her head against the hard kitchen table. She lifted her body from its awkward position. Blood hadn’t yet returned to the lifeless arm as it swung out and knocked the empty wine bottle to the floor. Karen turned her head, braced for the crash, scolding herself for being careless. When the expected clatter didn’t happen, she opened her eyes. Beth was smiling, her glassy eyes trained on the bottle as it stood upright obediently on the kitchen floor. “You know Harry doesn’t let bad things happen,” she said. It used to be cute how Beth spoke of Harry. Not anymore. He was like an unwelcome visitor who refuses to leave. Karen wanted to push him out the door, lock the windows and change her phone number. None of those things would work with Harry. Desperately, Beth pulled her daughter close, lodged her small head under hers and hugged her tight. She knew she shouldn’t try to dispel Beth’s imaginary friend. The psychologist told her it was normal, especially for a child who had suffered the loss of a parent. Harry was her way of dealing with those anxieties and fears. But that was a year ago. When Beth ran into the backyard later that afternoon, she looked as happy as usual. For now, it was all about the turtle pool. Beth pulled the pool away from the fence, scraping at the dry peeling wood. Once in place, the pool took up most of the small backyard. A voice called from the neighbour’s window. “Karen, don’t forget to put sunscreen on that child.” Mrs. Mc Norris from next door. Karen wished they had more privacy but that was hard to come by in a townhouse complex like theirs. Smiling, Karen waved at her. She was nosy but meant well. At least she’d stopped giving Karen love advice. She had gotten tired of hearing how a new boyfriend might help Beth. Karen didn’t agree that Beth needed a male presence in her upbringing. Karen didn’t have one when she was a child and she had long decided she was better off without men. Thankfully, Mrs. Mc Norris didn’t know about Harry. Sunburn was one thing. Karen didn’t want to hear well intentioned opinions regarding her daughter’s emotional health. She didn’t need anyone’s advice. She would take care of Beth on her own. Karen closed the back door, leaving a crack so she could hear the phone if the doctor’s office called to confirm the appointment. At first she disagreed that a psychologist could help but the school had insisted. Besides, good mothers do everything they can for the children. They make the right decisions, seek medical opinions and get help for their kids. Beth turned to Karen and didn’t seem to notice her mother’s worried expression. Maybe she thought Karen was squinting in the sun instead of examining the fragile emotional state of the little girl in the purple striped bikini, talking to her imaginary friend. “Mommy, can you turn on the water please?” she asked. Nodding, Karen turned the tap. Water rushed from the hose and thundered into the plastic turtle. As Karen pulled open the folding lawn chair, she forced herself to relax, to take a deep breath. Beth was happy, smiling. It was moments like that she wanted to savour. Maybe the psychologist was an over-reaction. Summer sun streamed down into the backyard, illuminating Beth’s brown hair, turning it almost blond in its bright rays. Beth laughed as she turned the hose and doused Karen with the cold water. It felt good. “Your turn, Harry,” Beth said. Beth turned the hose to the far side of the pool, spraying into the air. The mist of water hung in the air, slowly drifting in the light breeze, seemingly suspended in the dreamy sunlight. Beth laughed, going from a giggle to a cackle as the drops of water took shape around a form. A head, a body crouched with arms up, shielding, hiding. A silver shadow, the outline of a boy, lowered his arms and turned his featureless face toward Karen before the droplets of water fell away, making him disappear like a melting ice sculpture. Karen lunged for the hose. Beth turned away, guessing her mother’s intent. Beth sprayed. Karen grabbed the thin green length of rubber, pulling. Beth tugged harder with amazing strength. Karen lost her grip. Her feet slipped on the wet grass as she lunged for the hose again and pulled it down with her to the soft muddy ground. The hose went wild like an angry snake looking for prey. Water sprayed into Karen’s eyes, locking them shut. As she wiped them with slippery hands, the water turned warm. Warmer. Hot water streamed down on her, burning her skin. Karen screamed, helpless and disoriented. She curled into herself and found some small refuge in the cool mud. The water fell like fire all around, her eye lids clamped tighter, protecting the eyes within. “Stop it. Harry. No.” Beth’s voice was solid, firm, like the voice of a parent, not the child she was. Then the water was gone. All at once it stopped its penetrating attack. When Karen was able to blink her eyes open, the head of the hose lay still on the grass. It stared at her, innocent and apologetic. Karen lifted her head, pulling against her heavy hair, caked in thick mud. As she moved her body, Karen’s stinging skin complained. Beth’s face slowly came into focus. Quiet and innocent. Karen wondered if she’d imagined the whole thing, the water, the image in the mist, Harry. “I told him to stop,” Beth whispered. No. Karen hadn’t imagined it. Karen slipped into the cold shower to tame her tingling skin, but only after safely settling Beth in front of T.V. Beth wanted Cinderella. It was her favourite. It was also the last present Carl had given her a few months before he died. He usually did buy presents afterwards but the guilt and remorse was always too late for Karen. Karen left the shower curtain half open where she could see through the open bathroom door, down the hall. From the shower, she could hear the step-sisters’ singing lessons. Karen wondered if Beth ever remembered those moments, the ones that came before the presents. Karen never forgot. Karen wanted to get rid of that movie after Carl died, like everything else that survived the fire. But Beth loved to dance along with Cinderella when she arrives at the ball. The cold soapy water coated Karen’s skin, but like the presents from Carl, the water couldn’t undo what had happened. Flashes of the scalding water and screams in the backyard invaded her thoughts. She pulled the shower curtain across. The metal rings scraped along the rod, forcing out the unwanted memories. Karen stepped out of the shower, wrapped herself in a thread-bare towel and wiped her hand across the fog on the mirror. Her reflection stared back, her red-tinged skin like a punishment for thinking everything was going to be okay. Down the hall, Beth laughed. The mice were singing. Cinderella’s dress was almost ready. Karen wondered if she should throw away the movie after all. Maybe tell Beth it got lost. No girl should be allowed to think that mice can make a dress. Magic can’t turn a trampled girl into a princess. No man can save you from your life. Damp hair fell on Karen’s shoulders as she sat next to her daughter on the couch. Karen pulled the blanket on Beth’s lap to cover them both, wrapping them together. Beth leaned in to her mother as Karen put her arm around her, placing a light kiss on her head. “That’s why Harry got mad today. He doesn’t want you to take me there,” Beth said. The fairy godmother started to sing. Beth sat up on her knees and bobbed to the music. She smiled and reached out her hand. On her feet, she grabbing the air and danced, arms outstretched. She laughed and sang along as she turned in circles with an unseen partner. Her eyes closed as she twirled around, faster, then faster. Karen got up, ready to catch her, waiting for her to lose her balance. But Beth kept on going until she was spinning out of control. She reached toward Beth, trying to grab her arm, to steady her, save her from the whirling nightmare. A blast hit Karen, cold and sharp against her skin, robbing her of air. Beth spun free, stumbled backward and crashed into the bookcase, sending its contents to the floor. Picture frames shattered as they met the wood floor. Worthless decorations Karen had collected over the years tumbled off the shelves. Carefully stacked mail and newspapers went airborne. The Cinderella case flew off the shelf and landed at Karen’s feet. “This is not funny!” Karen picked up the Cinderella case and shook it in the air, stopping when she heard a muffled whimper. Blood streamed down the side of the child’s face from an open gash above her left eye. Karen dropped the movie case and ran to Beth, scooping her up in her arms. “What did I do?” Beth asked, her voice small and tenuous. “You don’t think I did this to you. Do you?” Karen asked. Karen pulled Beth toward her, enveloping her daughter in her shaking arms. One hand lifted to Beth’s head and smoothed down her messed hair, patting and soothing the troubled head of her only child. The psychologist’s waiting room was small but colourful. Beth loved the books, the doll house and the rocking horse in the corner. A children’s program played on the t.v. hanging from the ceiling. Not Cinderella. A woman with a sympathetic smile took Beth’s hand and led her from the room. The other parents in the waiting room sat silently, pretending they weren’t curious about each other. Karen walked down the hall to the elevator. She had an hour to kill. She wanted a coffee. The elevator was empty when Karen stepped on. She tapped the button for the second floor. Then again, impatiently. Karen crossed her arms. She hated hospitals. She should have brought something to read in the waiting room but she knew she couldn’t concentrate, not in that hospital. The elevator moved, obediently down. Then faster. Faster. The lights on the floor numbers tumbled down the list. Karen was thrown to her knees on the brushed metal floor. Her hands went out to brace the fall. She screamed as the elevator flew out of control downward until it stopped suddenly. A ping announced the floor and the doors steadily opened, oblivious to the preceding terror. Unable to move her body, still crouched in the elevator, she stared out at the sign ahead. Emergency. She reached for the buttons and jabbed the second floor again. It didn’t light up. The ping sounded again as the ground floor button flashed. Karen stepped out into the lobby. A sign ahead pointed towards triage. She’d been here. The night he died. The night she thought she was finally free. The doors behind her slid shut as Karen spun around and jabbed the up button. Nothing. Then the down button. Anything to get out of there. Karen scanned the signs for a staircase. Just one floor up to the cafeteria. She needed a coffee, the strongest they had. She flew around the corner, following the sign, narrowly escaping a collision with an elderly man. Pushing open the heavy metal door, her feet tapped along the concrete steps as they echoed through the tall stairwell. When she almost lost her footing, she gasped and slowed down. Karen grasped the metal railing, its peeling paint rough against her sticky palm, as she glanced behind. No one was there. Then another set of footsteps, loud enough to be right behind her but again, she was alone. Karen jumped two steps at a time, trying to escape the invisible threat. A hard jab on her shoulders made her stumble, tripping on a step and falling hard. A sharp pain hit her head, blinding her while another jab hit her ribs. A sharp kick to her stomach knocked the air out of her and sent her hard against the wall. Her head struck the concrete, making a dull sound. Karen gasped and blinked hard, willing her blurry surroundings to come into focus. A light blue door with the number two painted in white was just out of reach. She wouldn’t wait for the invisible enemy to attack again. Pulling herself across the floor, blood dripped steadily, making a bright pattern against the grey floor. Her hand discovered a gash on her forehead, open and gushing blood, pouring into her eyes, tinting the world around her an ominous crimson as her tingling fingers tightened around the door knob. She squeezed and turned, dragging herself to her feet and through the door into the hallway. Pulling the door shut behind her, she peered through the glass window into the grey stairwell. Bright florescent light illuminated the stairs, eerie and gloomy in its emptiness. Karen leaned against the door, sighing deeply. She grabbed a tissue from her jacket pocket and lifted the crumpled ball to her head. The bleeding had stopped. No blood at all, not even a wound that she was certain was there a moment before. Her fingers examined the disappearing injury. There was no pain. No blood. No tender muscles where she was so violently attacked. Insanity. It was the best explanation. Better than the alternative. Karen watched the activity of the cafeteria down the hall. She stumbled as she walked towards the noise, certain that she’d be safer among people. At least there he couldn’t attack her. Back in the waiting room, Karen sipped her coffee and glanced at the other parents. A father reading a newspaper. A woman checking her messages. Another mother imploring her two children to share, the panic in her eyes gave away her expectation that the two would make a scene. Karen eyed them all, judging like they would judge her. You never really know what’s in people’s thoughts. You can’t predict what they are capable of, no matter how normal they seem, how responsible they want to appear. The woman with the sympathetic smile returned. She raised her eyebrows and waved Karen into the hall. She followed the doctor whose heels clicked along the scratched tile floor. Karen stared absent-mindedly at her back as she led her into a cold, sterile room. A single file folder lay on the metal and formica wood desk. Karen nodded and smiled pleasantly. She knew more was coming. She wanted her to get right to it. The doctor reached for the folder and opened it. Eyeing the paper inside, her eyes narrowed. Karen nodded. Wouldn’t most children minimize something they think is wrong? If Karen could see that, how could the doctor not? Her father. Karen’s hand swept over her forehead. Still no gash. Karen slipped back into her chair. “Which circumstances are those?” Karen asked. Karen agreed. Beth should not know those details. That’s why Karen never told her. And after all that had happened lately, Karen thought she knew who did. Karen stared at the red light. Pedestrians walked past her absent gaze. In the backseat Beth brushed the hair on her Barbie. When Karen heard whispering, her eyes darted to the rear view to watch her daughter. “Stop talking to him,” Karen snapped. “I don’t care. Just stop it!” she shouted. Karen mumbled under her breath and turned into the gas station on the corner. “Stay here while I gas up, Beth.” Beth didn’t answer. Her head was turned toward the street. “Beth, did you hear what I said?” A man at the car next to hers turned and eyed Karen sceptically. She didn’t care. Their old street. Karen avoided coming back to this neighbourhood but there wasn’t any other way to get to the hospital. Karen slammed the door, angry with herself. He was getting to her and she was letting him. She pushed the pump into the car and tried to ignore the man who was still glancing her way. He was also judging her. And why not? She was guilty. What good mother would want the father of her child dead? Even if the man was Carl. The gas rushed from the hose into the empty tank. Karen watched the man drive away. He wasn’t staring anymore but she was sure that he’d convicted her in his mind. The pumped popped. The tank was full. Karen turned to screw back the cap and saw through the car window that the door on the other side was open. The car was empty. The discarded Barbie lay on the car seat, mocking her. Karen scanned the gas station but Beth wasn’t there. Bathroom? Convenience store for snacks? No. Karen turned to the road and caught the flash of a purple jacket. A pony tail she recognized appeared between the tree branches. Thankfully the man from the neighbouring pump had left. She ran after Beth. She could catch up if she cut across the mall parking lot. Then Beth took the short cut through the park. Karen lost sight of her as she reached the park but it didn’t matter. She knew where her daughter was going, where Harry was leading her. Turning the corner onto her old street, she saw the fence, the one the building company erected to keep out kids during the construction process. The burned house was gone. Foundation for a new one had been laid. And there was Beth, scaling the fence, one chain link at a time. “Beth,” Karen screamed again, knowing it would only make Beth go faster. When she reached the fence, Karen pulled herself up, slower than Beth, but determined to reach her daughter. Once inside the fence, Karen tripped on a copper pipe and stumbled toward the towering wood frame. The setting sun shifted between the iron beams of the house’s frame, blinding her as it appeared and disappeared. Karen paused to listen. Hearing nothing, she gripped a pillar for support and stepped onto the concrete foundation. Karen walked along the edge until she reached the wooden plank that led across to the other side. Beth must be there hiding behind the sheathing. Karen had just a second to react as she saw the metal beam fall. She raised her arms to shield her head but the beam pierced her in the chest, slamming her off the tenuous ledge and knocking her to the bottom of the concrete foundation below. Karen struggled to move. Pain ripped through her as she brought her trembling hands to her chest. Blood oozed from her body to the fresh concrete underneath. Through her spotty vision, Karen saw Beth standing above on the ledge she had just occupied. Beth’s voice sounded hollow. It echoed in her ears along with the sound of rushing blood. “Beth. Get help,” Karen managed to utter, her voice weak and shrill. Could Beth even hear her? She couldn’t be sure. Beth hadn’t moved. She stood frozen, witness to her mother’s tragedy, unmoving as Karen’s vision blurred. Karen was faintly aware of a groan of the structure above. A second beam, falling and silent, passed in front of Beth on the ledge, and straight through Karen’s heart. Karen’s empty eyes stared blankly through her daughter. As her life faded, she thought she could hear the crackling of fire. Behind Beth in the shadows of the flames, stood a figure with a thin smile of revenge on his face. The boy in the mist turned to leave followed by Beth until they were both out of sight. 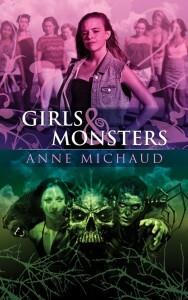 Girls and Monsters, released on April 30th, is a dark but uplifting collection of five Young Adult novellas. It was my pleasure to interview author Anne Michaud about her upcoming release and writing. Have you always loved reading horror? Depends – I’ve always loved dark horror, not the gory-bloody-torture type of thing. I mean, vampires could be considered dark horror, ones like Lestat and Dracula are way more dark than gross. I’m not even sure I like to be scared, but what I love is to read/hear/see the other side of things, explore worlds I probably never will by being a good girl, and live thrills and chills without being scarred for life (as straight horror tends to do). Did anything scare you as a child? Oh yes, pretty much everything. I got stung by a yellow-jacket wasp as a kid and came this close to pass away, so my phobia of needles started during the treatment of this allergy. There was E.T. that scared the crap out of me, thinking of that ball coming out of the closet still makes me freeze of fright. Ghosts always made me shiver – my sister taking great advantage of this weakness to prank me throughout our childhood. It stopped at around 10, though, when I started to read and expanded my mind to something a little more darker… and falling in love with it. Oh, too many to mention. The biggest would be my journals – I have tones with a couple lines in them, abandoned because the paper wasn’t thick enough or it didn’t smell right. Yeah, I know: issues. A grabbing plot, because for me, you can have the most interesting character, but with nowhere to go and nothing to experience, it just falls flat. A good plot with twists and turns and surprises will reveal any character, even the boring ones. First, a singer (I cannot hold a tune for the life of me). Then, a hairdresser (blame Robert Smith of The Cure for that). Then I had a super long filmmaking phase that took me through high school to recently, on one of my short films set, where I realized I preferred the writing part and nothing else. Writing has been my obsession for the past 7 years. Which of the characters in Girls and Monsters is most like you? Ouch, tough one. I’d say all the girls have a part of me: Liz and her unlucky strike in love, Scarlet and her fright of going insane, Katherine and her love of pets, Christiane and her coping mechanism and Brooke and her fear of losing what and whom she loves. What is your worst habit as a writer? When I’m not satisfied with a story, I cannot start the next one. I can try, but it won’t work – I’ll be thinking of the one I left behind, incomplete and unfinished. It’s not really a bad habit, until there’s a deadline involved. Do you consider the protagonists in your stories to be role models for young women? If so, why? Some yes, some absolutely not. What I want girls to remember reading this is that they can be strong and lead their own lives without the influence of boys and adults. Don’t get me wrong, boyfriends are great and parents cannot be ignored, but at some point, girls have to understand that we’re all equal (even if religion, politics and employment say the opposite), that we’re all strong enough to battle whatever evil stands in our way, and that being yourself is the best way to be happy. Do you look to your own phobias to find subject matter? Are your stories the products of nightmares, childhood experiences, fantasies? I draw a lot from my dreams/nightmares: Death Song’s first bathroom scene and We Left at Night’s first act were both dreamed years ago and noted down my journal. I wrote the huge spider in Dust Bunnies because so many people are scared of them (but not me, I love them and find them beautiful!). A Blue Story was written with one of my biggest fear in mind: having to leave behind everything I know, especially beloved pets. That for me is as scary as going insane, as I explored in Black Dog. What draws people to horror novels? Why do we, as readers, like to be scared? Because it’s something we (hopefully) will never live! The thrill is to go through hell and come out alive – but not by ourselves, through someone else’s eyes. She who likes dark things never grew up. She never stopped listening to gothic, industrial and alternative bands like when she was fifteen. She always loved to read horror and dystopia and fantasy, where doom and gloom drip from the pages. She, who was supposed to make films, decided to write short stories, novelettes and novels instead. She, who’s had her films listed on festival programs, has been printed in a dozen anthologies and magazines since. She who likes dark things prefers night to day, rain to sun, and reading to anything else. Giveaway!! 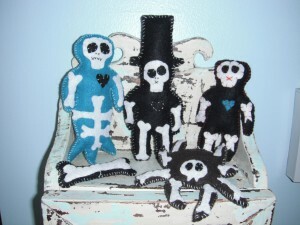 Softcover copy + The Monster Collection Skellies, 5 pieces handcrafted by the author. I know which one is my fave. Which one is yours? 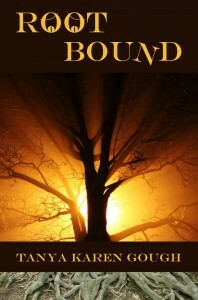 Recently I finished reading Root Bound by Tanya Karen Gough and had to contact the author for an interview. I was so taken by the story, its unique premise, the engaging character of Emma and the humour of the Brownies. Root Bound is a fast-paced, action fantasy novel about a young girl finding her place in the world through a series of adventures involving magical creatures, and a journey to the centre of the earth. Root Bound is both a topsy-turvy riff on traditional literary children’s fantasy and an allegorical coming-of-age tale. Thank you to Tanya for participating in this interview. In Root Bound, I was taken with how you describe buildings as alive, how they absorb life, grow roots and have the power to change lives. What inspired this concept? How does this work as a central theme in the book? I’ve always been fascinated by places where reality and magic overlap. In Victorian children’s literature, you find them in nature, expressed as faery rings or mounds, dark holes in the ground or in trees, places that evoke the mystery of nature. Indoors, magic has traditionally lived in the shadows, behind doors, through the coats in the wardrobe. It’s harder to find those places in the modern age. Nature is getting harder to find, or it’s reduced to a little patch of grass down the block. Electricity means there are fewer shadows, fewer places for magic creatures to hide. Root Bound grew out of the question: where has all the magic gone? Once I realized the series would be based on the elements (earth, water, fire and air), the specifics became clear to me. The first book is about finding one’s place in the world, finding one’s real and metaphorical roots, so it had to take place in the earth, and the buildings’ roots become a nice way to illustrate the connection. I also really like the idea that we are ultimately responsible for creating those roots, and we have the power to make them grow. We decide how much magic there is around us, and also whether that magic is good or bad. What message are you making about bullying in Root Bound? Bullying is complicated, though in Root Bound, it takes on a fairly simple form. The bullies are larger than life, clearly up to no good. And Emma fights them by standing up for herself. Standing her ground, so to speak. But she is quite young and inexperienced, and the world tends to be overly simplified at that age, too. The bullies stick around through all four of the books, though. You’ll see that the nature of their bullying changes, and Emma has to keep finding new ways to overcome them. Do you consider Emma to be a role model for girls? Why or why not? I don’t know if I think of her in terms of being a role model, per se. I get tired of a lot of the new “feminist” characters and the female heroines in modern action and fantasy. Both genres are still constructed for the male mentality. There’s a goal, and the hero has to do A, B and C to win. If there’s a strong woman nowadays, she’s usually a fighter. Or it’s still all about winning the handsome prince. I didn’t want that for Emma. Life is complicated and difficult, and if you’re a woman, it’s almost never linear. I want Emma’s experience to reflect that, so each of the books represents a different challenge as she grows up. I hope she inspires girls to ask questions about why her world isn’t all neatly packaged and easy to explain. We need to do a better job teaching our girls to ask how and why instead of expecting the world to offer them things in neat little packages. Are the brownies based on mythical creatures? They are! Brownies have a long and illustrious history, starting in Scottish and Northern English folklore. I’ve actually just published a history of the brownies on the Emma & the Elementals Blog. Not grow up, I think. I never was very good at imagining my future. I’m still not very good at it. So far, I’ve been a teacher, owned a CD and video store, built a Shakespeare speciality catalogue that had customers in 42 countries around the world, and reinvented myself yet again as a web content manager. I kinda like not knowing what comes next. It starts with language for me. If it’s not well-written, I just can’t stick with it. The stories that move me the most have a strong emotional through line, and characters I understand, even if I don’t relate to them. I appreciate any story that takes me out of my present reality – and that usually requires a well developed fictional world. I find it very difficult to write at home, probably because I did so much of my homework at the cafeteria and student union when I was in university. I also hand-write all my first drafts. A computer is fine if I’m writing for work, but I can’t write fiction that way. I need to feel an organic connection to the words – the shape of them, how they flow together, how they feel on the page. I can’t get that from a keyboard. I don’t think anyone ever knows they are a writer. I think people either write, or they don’t. I’ve been writing in one form or another all my life. I didn’t write fiction at all for many years, but I was learning new craft: content management forces one to think about words as discrete packages of information that can be moved around in various ways; marketing requires a very different sort of creativity, where you need to compress a very large idea into very few words; social media is a totally different way of communicating as well. So, even when I wasn’t Writing, I am always writing. Why did you decide to self-publish Root Bound? What is the biggest challenge with self-publishing? I started shopping an earlier draft of the book in late 2007, early 2008. I got a lot of great responses, but it was clear the book needed some more work. I took the feedback I received and did some rewrites, but by the time I was ready to start shopping the book again, the book market was in a tailspin. Agents were freaking out, and no one knew what was going to happen. I’d been through it all before with my CD store (which I closed shortly after Napster launched), and with the Shakespeare catalogue (which I closed shortly after YouTube and Netflix emerged). There wasn’t anything I could do. In the meantime, the recession was in full swing, and I moved to Toronto for work. By the time the dust settled (both for me and for the book industry), self-publishing had become remarkably easy to do. I didn’t want to spend any more time sending out queries and working through the agent process all over again. So I decided to do it myself. Absolutely the biggest challenge for me has been getting the word out there. The problem with self-publishing being easy is that *everyone* is doing it now. There’s so much noise out there, and it’s very difficult to cut through the noise. I was lucky that most of the technical requirements were already part of my skill set, thanks to my job. I don’t know how non-technical writers figure all that stuff out. How do you handle reviews? So far, I haven’t really received any truly negative reviews at all, and I’m grateful for that. In a recent blog tour, one of the reviewers couldn’t get into the book, which I think is perfectly fair. She withdrew and was kind enough to feature the book on her blog with a straightforward excerpt instead of a review. I sent her a note thanking her doing that. In the same tour, I got two of my strongest complaints on the same day: one complained that my fantasy world was over-developed; the other complained that it wasn’t developed enough. I just posted the comments together on my blog. It was a pretty clear lesson that you just can’t please everyone. I have a hard time cutting unnecessary characters. There was one in Root Bound who just didn’t want to go. I argued with her for weeks. She wept, she begged. She made me feel terrible about it. Finally, I had to agree to give her a featured cameo in a later book just so I could get on with my writing. Can you give us a taste of the next book in the series and when it will be released? Sure! Book Two is called Water Works, and I hope to have it ready by Fall 2013. Water Works is about ways of thinking about the world. Things that were true in Book One may not be true in Book Two, or they may have changed because things change over time. Emma is now best friends with Reggie (the boy in the apartment down the hall in Book One), and she’ll have to save him again. And the stakes are higher now, because now she’s saving someone she actually cares about. Some of the characters from Book One return, but probably not the ones you’d expect. And because this book is about changing realities, she won’t be travelling in the classic Greek and Roman mythological world this time. She’s going some place less familiar. I’d like the reader to discover new worlds, too. Thank you to Tanya for being here on my blog. Seriously, writing a whole first draft by hand! I can’t imagine. Tanya Karen Gough owned and published The Poor Yorick Shakespeare Catalogue from 1997-2007, earning a strong international customer base of world class academics and high school educators. Tanya was also a contributing editor for the Internet Shakespeare Editions at the University of Victoria (BC), audio advisor for the Sourcebooks Shakespeare textbook series, and theatre reviewer for Playshakespeare.com. 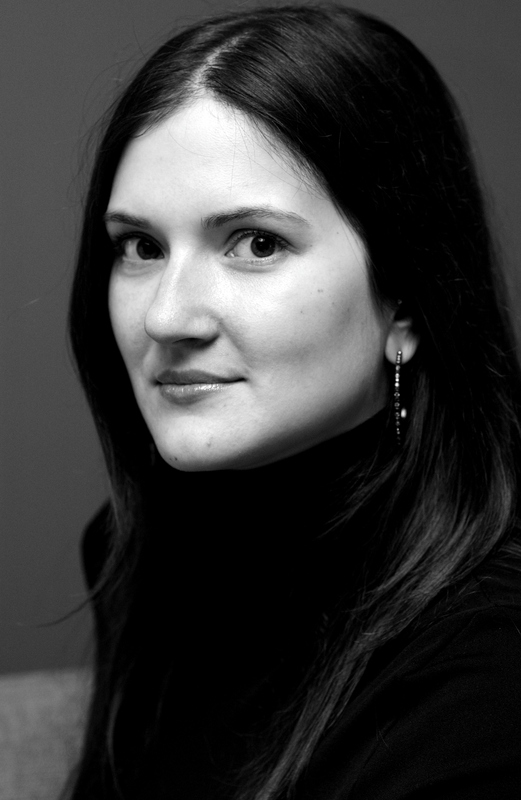 Tanya grew up in New Hampshire and currently lives in Toronto, Ontario. 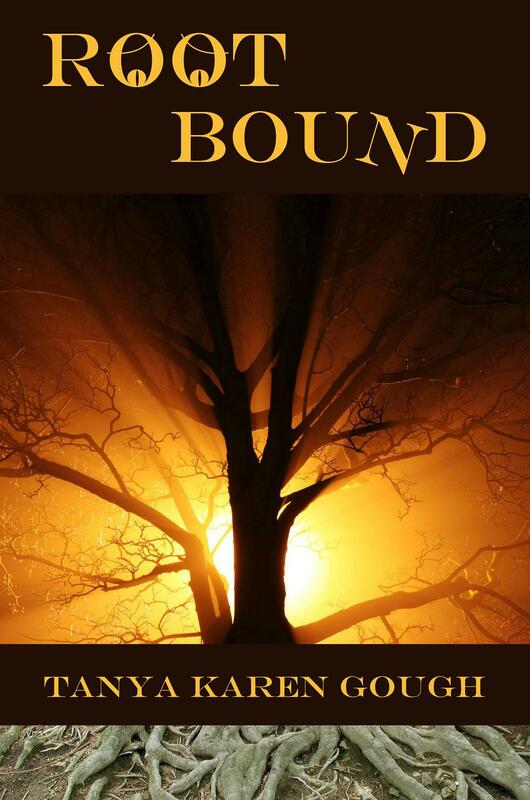 Click here for a complete list of where you find a copy of Root Bound. Check out her blog http://emmaseries.blogspot.com where you can find out more about her and her series. You can also find her on twitter @emmaseries. Some of the best stories are short. Think of those creepy ghost stories told around a campfire. Or the tall tales exchanged on bar stools. How about the hilarious misfortunes of a friend who has you almost spitting out your coffee across a kitchen table? These stories capture us quickly, reel us in and make us feel. Done well, short form fiction is just as satisfying. 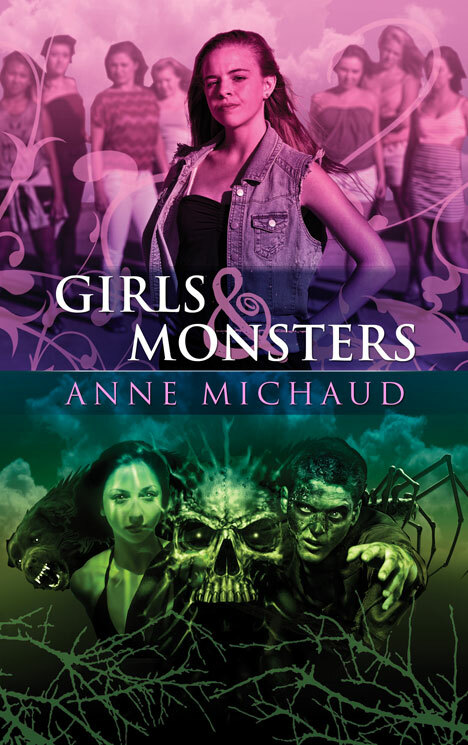 Anne Michaud gets it right with her collection of short stories in her upcoming release of Girls and Monsters, by DarkFuse. You can get it April 30th but if you can’t wait, enter her Goodreads giveaway for a chance to win a copy. The contest is open until March 18th so click the link today! To wet your appetite, the following is an excerpt from one of her stories, Death Song. Love this! Something catches in the back of my throat. I hide my face in my hands to quiet the sobs. But then, something ain’t right. Air moves around me and I stop. I look between my fingers, but the blur of my tears thickens everything: the bathtub, the towels, and someone on the floor. A woman’s in here with me, door still closed and locked. An exhale, like after a deep swim, and a smell, like the swamp close to my empty home. A chill runs down my back, I wipe my eyes, rub and scratch them to see more clearly. And I do. Two gray hands scratch the floor tiles, nails green with algae, putrid flesh sagging on her legs, arms and torso, hair so long and wet and heavy, it drags her down. Diluted, impossible to focus on, like little waves rippling over her body from head to foot, seaweed in the water. Scales and fins, mermaidlike, little knives, those are. And they scrape the floor, like a fork on a plate. It’s her – Limnade. A melody, reminding me of something lost, tickles my ears. It drags on until the sweetness turns sickly, vibrating into a full-on super-scream, hyenalike, enough to pop my ears and make them bleed. Her large mouth deforms her face into one gap of black, the cry so high and strident, I scream from the pain. Limnade stares at me, everything but her fades away—Jo’s nice bathroom, Jo’s new life, Jo himself, none of it matters anymore. Her fingers brush my forehead, they’re cold and sticky like clams. And I let the darkness take me away. I don’t really play many Christmas songs for myself. Generallly, I get enough of them from the world around me in stores and in commercials. But for some unexplained reason I found myself at iTunes this week searching for Christmas music and discovered Christmas with Weezer. Whether it’s the crazy distortion on the guitar or just the moody tone, the band has stayed true to these classic songs while giving them new life for me. And that’s one of the great beauties about art. Musicians, like other artists, can add their personality to their craft, making it their own so that no one song will sound the same when performed by two separate artists. Writing is the same. Voice is so important to what we do. Writing voice gives our work personality. Character voice makes the players in our story stand out from each other. Two writers can tackle the same story with the same plot and characters and come out with different versions, completely unique thanks to the voice of the writer. Agents love it too as many of them say strong voice is what they look for in a writer’s work. So how can writers perfect the art of voice? I often wrestle with this. I have the tendency to write out the voice in my writing. By this I mean, I appreciate craft and know this is also something readers and the publishing industry both value. Good writing is essential. But when I am too conscious of the craft of writing, the voice is dull. If I’m not careful, my focus on the structure can kill voice when I sit down to write. So I try to find a balance, knowing I must have both. I’ve always felt the best way to write with great voice is to give myself permission for imperfection. Then the voice comes. After all, when the first draft is finished, I can go back and fix things that fall under the umbrella of craft. Most important to me is that the writing has personality and that the audience has read something from a unique perspective. So I hope you find inspiration in the arts this season and here’s to letting our voices speak. 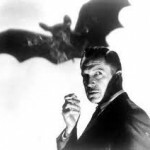 Each Halloween I am reminded of how much I miss Vincent Price who passed away several days before Halloween 1993. Growing up in the 80’s, Saturday mornings meant waking up and watching Hilarious House of Frankenstein in which Price performed the intro and various spooky poems and monologues. He was the epitome of everything creepy, both back then as a child and also today. To this day, the best part of Michael Jackson’s Thriller is Price’s monologue at the end. Click here to listen to the original recording of Vincent Price’s Thriller Rap. Skip ahead to 0:34 to where it begins. I remember once reading a story about Rod Temperton and how he wrote the words to the thriller rap in the cab on the way to the studio, finishing it just before Vincent Price arrived. As a writer, sometimes those moments when you don’t have time to think about what you’re writing and the adrenaline kicks in produce the best writing. This must have been the case with Temperton because combined with Vincent Price’s creep-tastic performance, it is a Halloween classic. 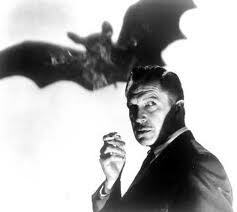 So every Halloween, I will watch and listen to a bit of Vincent Price and remember how he made every day Halloween for me as a kid and thank him for being an early influence in my love for horror. Who do you think of when you remember your first fascination/fear of horror? I got tagged by Anne Michaud in The Next Big Thing Blog Tag and I’m happy to play along. Please stop by Anne’s blog and read all about her. She has a book release coming up early in the new year and her website is well worth a read. Where did the idea come from for the book? I’ve wanted to write a book about a guitarist in a band for a long time now and I can’t write anything without a creepy element so I mixed the two. Which actors would you choose to play your characters in a movie rendition? Easy! Their pictures are in their character profiles. Kaya Scodelario and Chase Crawford (even though I’m usually inspired by characters with black hair, not blonds). What is the one-sentence synopsis of your book? The only way Patrick can get the strange visions out of his head is to write them into his lyrics but when the horrors of his songs come true and he becomes the main suspect, Elsa has the answers he needs to understand his abilities and clear him of the crime he’s accused of committing. Will your book be self-published or represented by an agency? Good question! How long did it take you to write the first draft of your manuscript? I just started and I’m on target to finish in January 2013. What other books would you compare this story to within your genre? It’s like the Darkest Powers trilogy by Kelley Armstrong in that my character also has a paranormal ability that he doesn’t understand but it’s different because there is a crime solving element. Who or What inspired you to write this book? Music. I love characters who use art to express their pain and suffering. What else about your book might pique the reader’s interest? While it’s not central to the plot, the book will carry a strong theme of romantic tension because after all, I am its author and I love that stuff. Please stop by their blogs and learn more about them and their projects. Recently I took an informative webinar through Writers Digest on how to write effective query letters. Michelle Wolfson from Wolfson Literary Agency had lots of great tips and helpful reminders, but one thing she said particularly stuck with me. Michelle emphasized that the goal of a query is to get agents to request pages. Yes, some might say duh! Others might have never thought of it in such simple terms before. Writing query letters is the art of saying just enough about ourselves and our manuscript to tempt the agent for more. Authors may pore over their pitch, squeezing in every plot detail, fearing they might leave out something important. But not all of those details are important as long as the letter piques the agent’s interest. If you take ten writers, each of their query letters will vary. Some may have a longer pitch, one bio may sound more fabulous than others, some will embody more personality. You would have ten different letters but each one of them can be successful in its own way. All it has to do is draw the agent in, tempt them enough to request more pages. I come from a background in human resources and used to sift through a “slush pile” of resumes and so I think of it like a resume. On one resume, it’s hard to convey how wonderful you are at your job. But if you can write a resume with just enough hook that a potential employer wants to meet you, the resume has done its job. Michelle’s tip is a good reminder for me and I hope it helps demystify the process for those of you who are writing your own query letter. I came across news of this year’s Write Across Ontario and I wish every grade 7 or 8 student in Ontario who has ever dreamed of being a writer can participate. Igniting the spark for writing at an early age is ideal. When I was in elementary school, I wrote a story for school. And I loved it. It was a story about a pair of ballet shoes that had been discarded as the little girl who owned them grew up. It was melancholy and sentimental (maybe overly so) but I was proud of it. I enjoyed writing it. And I was excited to hand it in. My teacher wasn’t in love with the story as much as I was and I remember feeling discouraged by her comments. In general, I am not easily offended but I remember feeling the hit, thinking maybe writing wasn’t my thing, that I would find something else I was good at. Even well-meaning teachers don’t realize how harmful their feedback can be for kids, especially in areas of the arts because it is so subjective. Thankfully my love of writing won out in the end but I wasted precious years to realize this. When I see contests, like the Write Across Ontario, it excites me. It gives students who love to write a fantastic challenge and an opportunity to submit their work for review. They may allow their friends, family and teachers to read their stories, but sending it to an outside organization for critical review is great way for them to taste the world of publishing. In the end, whether they win or not, it’s up to us to encourage them and make sure they know that as writers, we want others to read our work but their approval isn’t always the end goal. So if you know a student in Ontario in grades 7 or 8, please pass this along and encourage them to meet their muse. Maybe my muse remembers her original inspiration for the ballet shoes thing. I might have to revisit that. I’ve been experimenting with writing targets. It’s not for everyone but writing and I get along best when I’m in charge. Some writers prefer to let inspiration come knocking on their door. I like to chase it into a corner or the project will run on and on. Like any creative process, different methods get different results for different writers. This one works for me at the moment. This target has changed over time, but I think (without jinxing it) that I’ve found the right number. I have a daily goal of 1K, as measured by the target bar in Scrivener. It’s reset at the beginning of the first session of each day. Love that target bar. It goes from red to green, a visual reminder of my progress to that number. 1K isn’t much. Some days it’s enough, and others it’s just the start of a much longer writing session but it’s a goal that allows me to have balance with other things in my life. So I toil away until the bar is green, then either call it a day, or keep writing. Most jobs require set number of hours worked in a day or week, mine does too. It’s not necessarily because I have a deadline, it’s just that without keeping track, I don’t feel done, I don’t give myself permission to do other things, including reading which often gets slapped on the back burner. This way I get balance. So whether I reach my target by noon, or hammer it out between the hours of 10 pm and midnight, the target is a tool that works for me. But what about when targets are missed? After all, we are not machines. Life sometimes gets in the way of best laid plans. The problem with writing targets is the guilt trip associated with not achieving a daily target. This will happen. I try not to feel like it’s me vs. the writing target, like I need to conquer it, like I must win. This will lead to frustration. The target for me is a partner in the process, just one tool I use to get words on paper (or the screen). Then when I’m having a target-challenged day, I tell myself tomorrow might be better. Do you have writing targets? How do they work/don’t work for you.